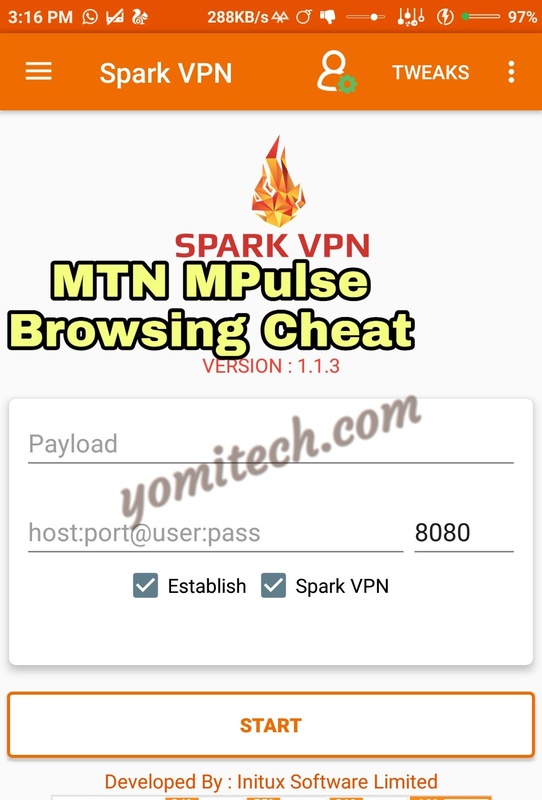 I am pretty sure most of you are still flexing the MTN MPulse cheat as well as the N0.0k free browsing cheat. If you are not then you are really missing out. It's not too late though as both tweaks are still blazing as ever. I have shared the HTTP injector settings for the N0.0k tweak but for the sake of those with rooted phones and also those complaining of the speed, I have decided to post another alternative using Spark VPN. The spark VPN also works flawlessly like the HTTP injector and the best part is that it works on both rooted and non-rooted android phones. Below is the settings. >> Spark VPN APK. Download HERE or HERE. >> Spark VPN config file. Download HERE or HERE. >> Download and install Spark VPN from this LINK. >> Download the MTN N0.0k config file HERE. >> Launch the Spark VPN app and click on tweak at the top right corner. >> Search for the config file you downloaded earlier and select it. >> After that, click on start and wait for a few seconds while it connects. Note: The free data is capped at 1GB PER day for each sim. So once you exhaust your daily 1GB, you have to wait until 12am for another daily 1GB or switch to another SIM. If you have any question, kindly drop it in the comment section below. Also, if you find this post helpful, don't forget to kindly share it with your friends and on your various social media platforms. Please is the 0.0k capped at 1GB as usual or it's unlimited? thanks it's working and it's very fast. After using it for just a day, Mine is no longer connecting again, I even downloaded HTTP injector, KPN tunnel app, put in the configuration files, none is working again, I don't think it works for 1gb per day again, once you use it once with any app and use up to 1gb with any of these apps your SIM automatically becomes useless to any of these apps, it won't connect again except you use anoda Mtn SIM. The 1gb data daily is on each SIM not each app, so irrespective of the VPN App you use, you are still limited to just 1gb of data on a SIM everyday. hi, please how do i download an updated configuration. Just click on the links in the post..
.they are still the same click but just different files..
Hi, Thanks for the post, but please do i have to be on Mpulse for it to work or on any mpulse plan? and if yes, if i sub for the 350mb plan on mpulse. will my browsing be restricted to that 350mb? can't seem to download with ucbrowser using kpn tunnel or spark vpn. any solution please? none of the app for MTN 0.0k is connecting, am I the only one? Maybe.. just make sure you follow the instructions..
A new one has been posted .. just read the comments below.. The links in the post have all being updated already, just download from any of the links in the post. Thanks bro for the codes u've been supplying, I really appreciate you. I'm still flexing with it. The mPulse still powers all Apps.